A little while ago I was given a Vest Pocket Kodak (VPK) by a gentleman at church. It had belonged to his grandfather. When he rediscovered it recently, his grandchildren weren’t interested in it, so he kindly offered it to me. It was in poor condition but I promised to fix it if I could. One of the scissor struts had snapped and the bellows had tears and pinholes. There was paint loss all over the bodywork, but surprisingly the lens glass and the shutter were both in great condition and fully working. 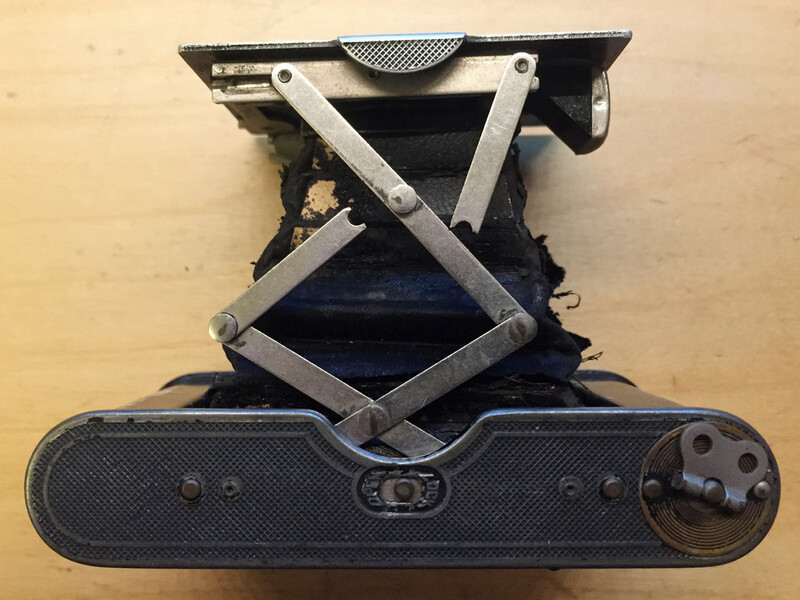 I investigated various options for manufacturing a new strut – the best method seemed to be having one laser-cut from 1mm steel but the minimum order cost was prohibitive and it was actually cheaper to buy another broken Vest Pocket Kodak on eBay and take the struts from that. It was easy to drill out the rivets on the donor camera and release the strut. The holes in the strut were different sizes and I had to drill the smaller ones slightly larger to make room for the smallest rivets I could find, which were 2.5mm. I also drilled out the rivets on the camera I was repairing to get rid of the broken strut pieces. I’ve never riveted before but I bought the cheapest possible riveter and a selection of small, short blind rivets. Once the holes in the struts were slightly enlarged, it was easy to pop a rivet in there and fasten it. In hindsight I should have put a piece of paper between the struts temporarily when they were riveted, and then removed it after riveting to give them some freedom to rotate. My rivets are a little stiff, but movable. A small amount of oil on the joints helped. The back of the rivets protrude quite far and are at risk of fouling the bellows when the camera is folded flat, so I squashed them a bit flatter with some pliers and filed off the sharp edges. The new aluminium rivets don’t look quite as nice as the original chrome ones but at least they’re functional. The replacement strut is duller than the original, too – but that’s OK given that the camera is over 100 years old. The next point of attention was the bellows. The overall structure of the bellows was OK but there were several splits and pinholes on the edges and corners. I didn’t think it warranted a full bellows replacement – which is lucky because that’s a tricky job. 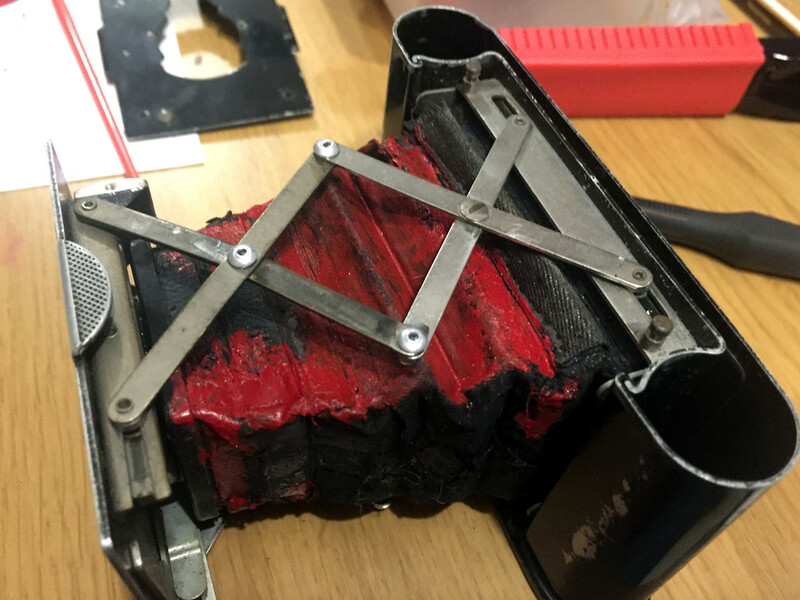 In the end I patched up these bellows by gluing the loose bits of leather down with UHU glue, adding some strips of fabric to give extra strength here and there, and covering the pinholes with an unusual substance called Liquid Electrical Tape. It’s supposed to be for coating electrical contacts in boats and motorhomes but it’s flexible, opaque, and easy to apply with a paintbrush, so it’s quite good at repairing bellows too. Unfortunately, it is bright red so it doesn’t really blend in. It’s not a beautiful repair, but it is functional. The Liquid Electrical Tape dried stiffer than I thought it would, so the bellows have much less flexure than I would have hoped. I think the bellows repairs would split if I forced the camera fully flat. It looks like it will collapse about halfway down without damage, and that’s enough to give the bellows some protection while I carry the camera in a rigid box. The film used by the Vest Pocket Kodak, 127 film, has been officially discontinued but there are still one or two suppliers. I bought a roll of Rera Pan 100 which is currently being manufactured in Japan. This should give eight nice black & images. With the camera ready to go, I’m waiting for some nicer weather before I get started. Hopefully I’ll get some negatives worth printing, and I plan to give one to the gentleman who gave me the camera. I hope he’ll be pleased. And what became of the Vest Pocket Kodak I bought for parts? Well, I took what I needed and donated the rest to someone who takes part in WW1 reenactments and was also looking for parts to restore his own Vest Pocket Kodak. It has a patent date of Jan 1910 and Jan 1913. Yes you could buy a parts camera and swap the viewfinders. Just be sure to double-check in advance whether the viewfinders were bolted or riveted onto the camera body. Also beware that these old screws are very soft now and you nay destroy it by undoing it. If you could have a source of tiny screws on hand that would be helpful (perhaps try a model train store etc). Thanks!…I didn’t know if the view finder had a retaining ring on the outside and just screwed on/off or if it was riveted on. I was hoping the outside ring just screwed on. I’ll look for a parts camera and try. Missing the viewfinder is significant. I’ve never had one of these before so I was happy to find it. It appears to work well, in nice shape other than missing the viewfinder. Also, I wondered why the viewfinder was missing. The camera body is not damaged around the viewfinder hole..
the hole is not a perfect circle like the viewfinder fit in and then somehow twisted to snap into place. To the previous point: Yes it screws on/off. The cutout sector limits the movement of the VF to a 90° range from portrait to landscape, there is a small stop on the VF. There are also a couple of thin brass washers to allow it to rotate easily.